In this book respected New Testament scholar Pheme Perkins delivers a clear, fresh, informed introduction to the earliest written accounts of Jesus - Matthew, Mark, and Luke - situating those canonical Gospels within the wider world of oral storytelling and literary production of the first and second centuries. Cutting through the media confusion over new Gospel finds, Perkins's Introduction to the Synoptic Gospels presents a balanced, responsible look at how the Gospels of Matthew, Mark, and Luke came to be and what they mean. ^"Pheme Perkins has dedicated her career to communicating her professional expertise in both the New Testament and the Gnostic Gospels to her students in the classroom and to a wider audience of interested clergy and educated laity. 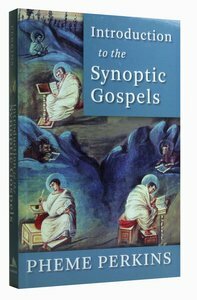 Now she distills both her vast knowledge and her teaching skills in this book on the Synoptic Gospels. But the scope of this volume is much broader than the standard introduction to the Synoptics. Perkins situates the Synoptics within the wider contexts of the composition and function of books in the ancient Greco-Roman world, the development of the idea of a New Testament canon, and the continuation of the Gospel genre in the Gospels of the second and third centuries. College and university professors will welcome this volume as a valuable teaching tool." About "Introduction to the Synoptic Gospels"
Pheme Perkins (Ph.D., Harvard University) is professor of New Testament in the Theology Department at Boston College. Among her many published books are Reading the New Testament; Gnosticism and the New Testament; Galatians; Ephesians (Abingdon New Testament Commentary) and the Politics of Faith and Peter: Apostle for the Whole Church and most recently Introduction to the Synoptic Gospels.